Stairs to roof deck which gets optimum sun through out the day. 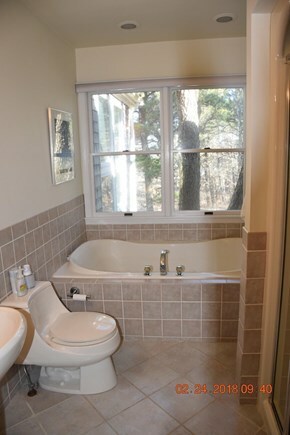 Master Bath with shower stall and jacuzzi. 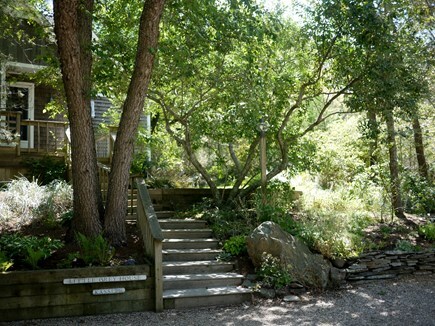 View of the front of house through the trees. 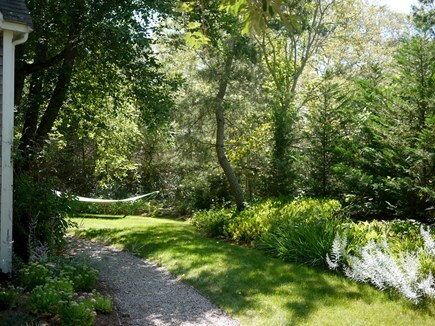 Right side of the house and view into the gardens and hammock. 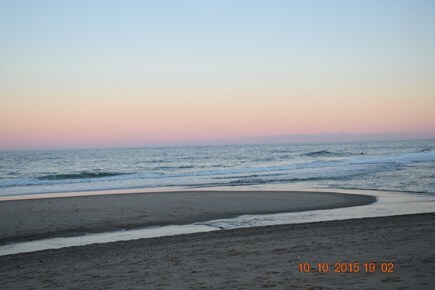 Newcomb Hollow Beach, endless beach to walk and enjoy. It doesn’t get any better than this! 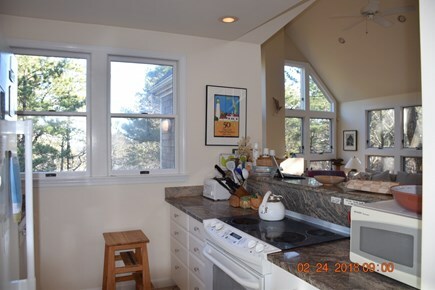 Located in the Cape Cod National Seashore and only 150 yards from Newcomb Hollow Beach, one of the Outer Cape’s finest ocean beaches. Short walk to private beach on Gull Pond. This architect-designed modern house has three bedrooms, two bathrooms, and exceptional amenities. Two fully furnished decks ensure comfortable outdoor relaxation. Sliding doors off the living room open to the lower deck with dining table and large gas grill allows for traditional summer entertaining. Three bedrooms sleep six and share two full bathrooms, one with jacuzzi. 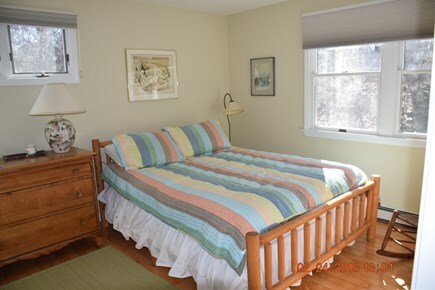 Each bedroom has a large closet and bureau. The large dining area opens to a spacious living area—all under a cathedral ceiling. The fully equipped modern kitchen with marble counter for eating/serving looks out to the dining/living area.The house is wi-fi connected The downstairs provides a second entrance to the house, washer and dryer, plenty of storage room, and a game area featuring a full-size ping pong table and couches. 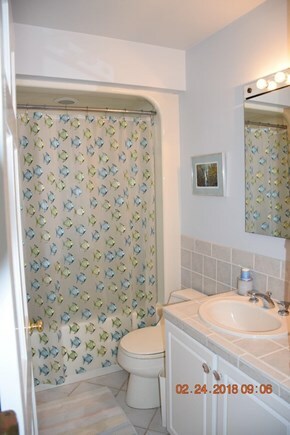 Also for your convenience are an enclosed outdoor shower and dressing room. 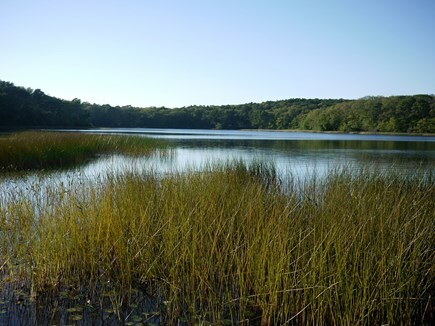 Magnificent grounds feature numerous indigenous flowers, trees, and grasses. Bird feeders attract a large variety of colorful birds. 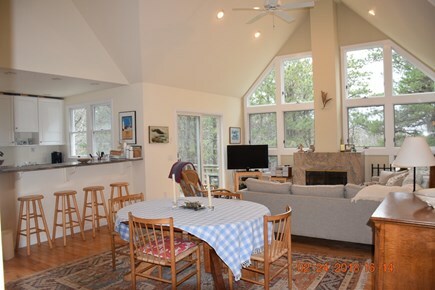 The house is a short walk to a private beach on Gull Pond. 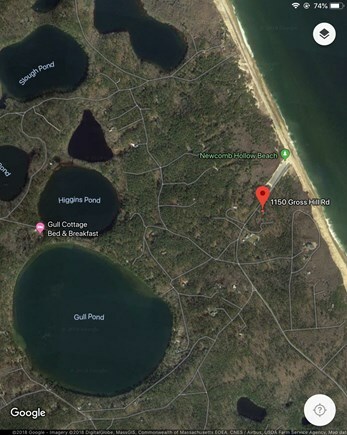 The swimming and boating areas in other fresh water kettle ponds in Wellfleet are all within a short ride. 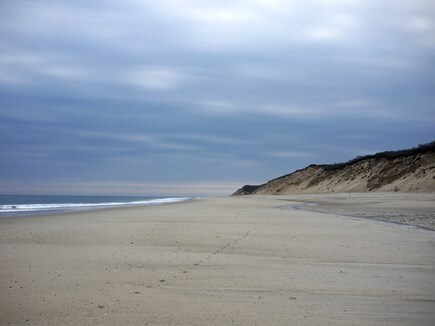 Wellfleet has public and private tennis courts, a golf course, an Audubon Sanctuary with wonderful trails, an off-road bike path connecting with Eastham and Orleans, exciting galleries and shops, a four-plex and a drive-in movie theatre, excellent restaurants, and a well-known live theatre company called “WHAT” (Wellfleet Harbor Actors Theatre). Additional availability info: no pets; no smoking; limit of 6 people. This is a Saturday to Saturday vacation rental. Additional pricing info: Tenants pays long distance telephone and pay per view TV. $350 deposit. State and local taxes of 12.45% will apply. Wonderful house, amazing location. Loved the roof deck and side porch for morning coffee. Ping pong table in basement. Homeowners are lovely. Highly recommend! Love the location. 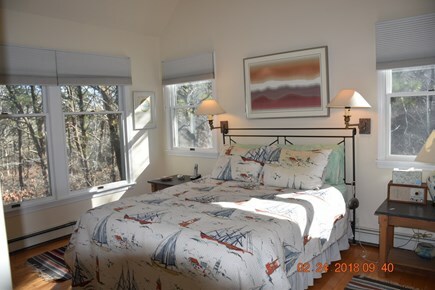 Just a short walk to the beach and a short drive to Wellfleet Center. The inside was very spacious, but we spent most of our time on the outdoor deck. Also, we loved the outdoor shower which came in handy after a beach day. We’ve been renting for about four years and planning on coming back. 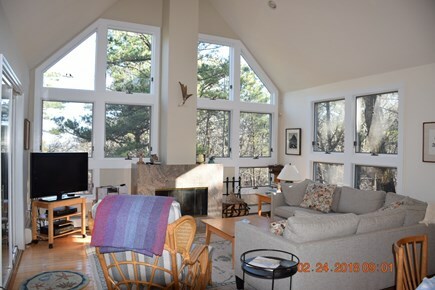 We love our vacations at this home, which is wonderfully located on a quiet wooded lot within easy walking distance to Newcomb Hollow and many ponds. 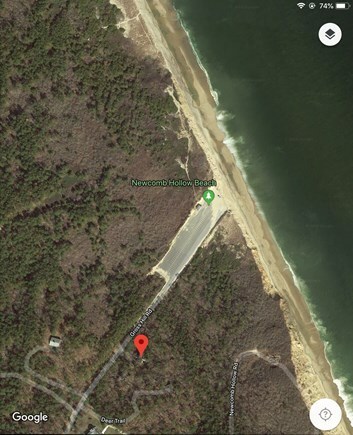 Ocean View Drive connects to the Cape Cod Biking Rail Trail. This beautifully appointed, yet comfortable home is equipped with needed conveniences and includes a lovely deck surrounded by a well-maintained yard. 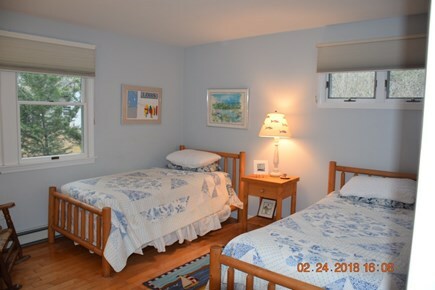 Ideal for our family of four, the warm and friendly homeowners make renting this charming Wellfleet cottage a true delight. 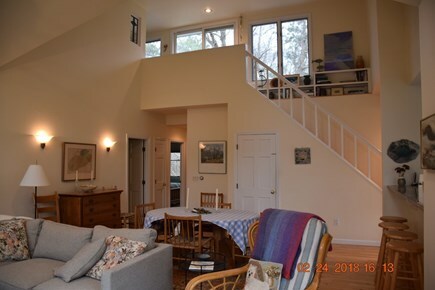 We love the open design of the kitchen, dining room and living room. Bedrooms are nice and big. Also enjoyed the cool ocean breeze at night. 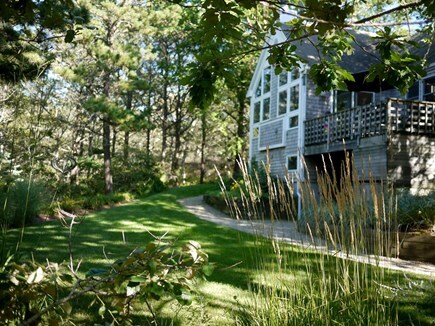 Loved the house!Proximity to the beach was excellent.The upper deck was a great place to read or enjoy conversation. As birders, we enjoyed seeing and feeding all the different birds.